Scaramanga: Etwa 2 Monate ist die Cam nun offline. Die Betreiber hatte ich angeschrieben, vor ein paar Jahren war der Kontakt sehr konstruktiv, diesmal jedoch war es nichts anderes als abwimmeln. Länger möchte ich nun nicht mehr warten das sich was tut, ab geht es ins Archiv! Etwa 2 Monate ist die Cam nun offline. Die Betreiber hatte ich angeschrieben, vor ein paar Jahren war der Kontakt sehr konstruktiv, diesmal jedoch war es nichts anderes als abwimmeln. Nestling in a valley amongst the Eifel Hills, Monschau really is one of Europe’s best kept secrets. 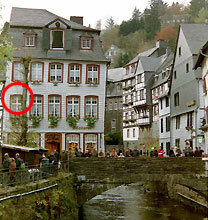 Located just a few kilometers from the Belgian border, Monschau offers visitors a wealth of things to see and do. Quaint shops, romantic old streets, half timbered buildings, a wonderful selection of restaurants & cafes, a historic mustard mill, various museums and the old friary to mention just a few. You will need your GPS and either a smartphone to take the picture yourself or a cell phone and a partner at his/her computer with an internet connection at a set time that you will be at the cache site. Sometimes something might not work. You should always take pictures with your own cam, if the webcam fails you are allowed to log with a picture that shows yourself with GPS near the listed coordinates. Go to the coordinates posted at the top of the page. They will get you to the general vicinity of the webcam. Find a place near the first tree. 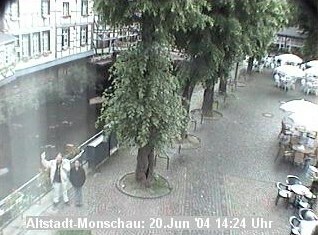 Use your smartphone or call your friend to go to http://www.monschau.de/de/erleben/webcam/. Hold up your GPS and find a spot where to stand for the best picture. The webcam takes new shots all five minutes. Open a bigger picture by clicking on the small preview. - Perform a mouse click right and save the picture with .jpg extension. - Open a picture editing program, i.e. Paint or Photoshop, open a "new" document/picture and go to "paste" in the edit menu to paste the webcam picture into this program. - Adjust the size so that only the webcam picture remains. - Save the picture as a .jpg and then it can be uploaded. You may as well download the picture from the webcams history. The history keeps pictures for about a week. Only one picture per hour is shown but this proceeds in 5min steps. Upload the saved photo with your log to get credit for the cache. Extra credit for particularly amusing or interesting photos! Logs without foto will be deleted.